Now say that title again. One more time..One last time.. But there is nothing twisted with these gorgeous Sizzix album dies. They cut through those multiple layers of papers so beautifull and they cut chipboard too. Yout must see the finish to believe. See all those die cut pages nestled between the album cover?? 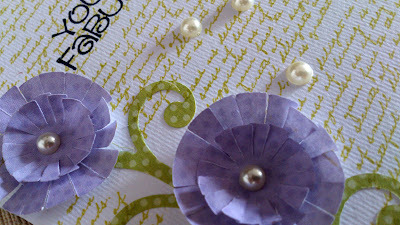 I cut a bunch of DCWV papers (Flower stack) amd fabriano papers with the Sizzix Scallop Rectangle #2 . 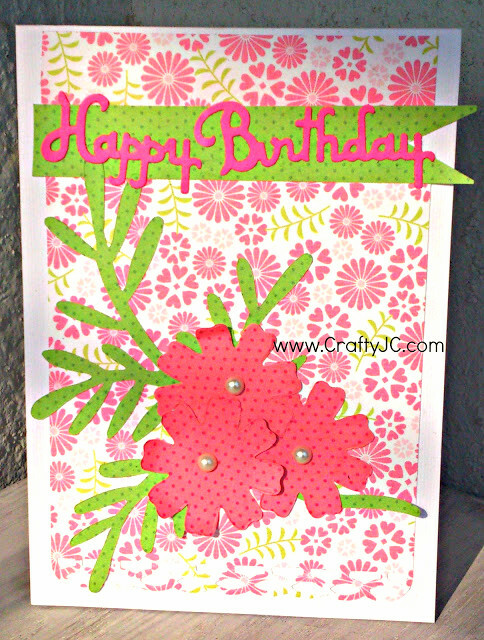 The center polka dots were stamped (Papertrey) on a frame die cut with Sizzox Decorative Frames. I chose the colours from the papers. Then added the layers of frames topped with this pretty bunch of felt flowers. The nice thing about the Frames is that, you can add layers without adding bulk. The die actually cuts those skinny frames which can be layered within each other - alllowing you to build layers sans bulk. Awesome idea!! My plan is to stamp to my hearts content on the inside and get some pictures added in of the girls. Thanks for stopping by. Feel free to ask any questions. Well, I spent the weekend trying to quilt that Blooms and Butterflies quilt I've been working on for months now. I tried to do the "stitch in the ditch" - how boring to line up all those ditches with the stitches - especially given that my quilt is quite large - 68x88 inches - or something like that. 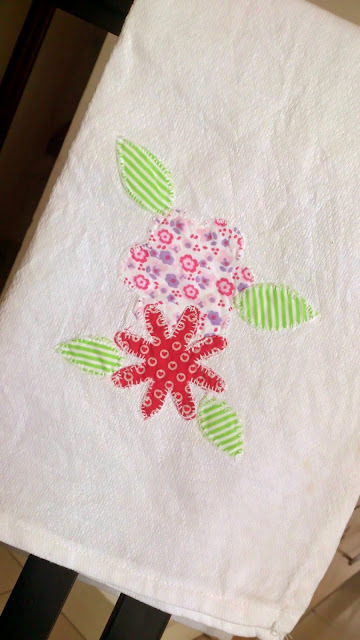 So, I tried a little bit of free motion quilting. What fun I say!! I think I will free motion quilt this one even though all the practice I've had is about 30 mins. After all, this needs to be fun for me too! I hope I will have something to show you soon. But in the mean while, I wanted to post a finish. :) The finishes frame-able art K made last week. Now to get this framed and send it to her grand-mum!! Last weekend was crafty at our place. My 4yo girl K wanted to craft. 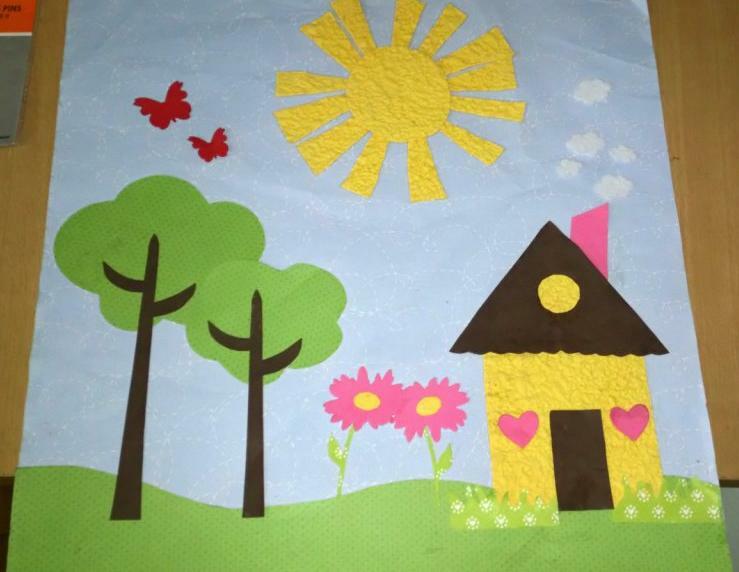 With the grandmom around, they both had fun making this frameable using those cute Sizzix dies and hand cut shapes. We die cut two sets of this really adorable tree die and I trimmed one of them down slightly smaller.. The grass, house was free-hand cut and then K started assembling them. My MIL was super happy to help K with all that. 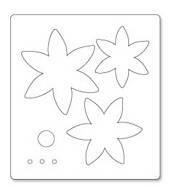 We cut a few other super cute shapes too (do you see that pretty pink flower in that bunch of die cuts?). Will post a picture of the complete framed art soon. Here is where I am. Finished with the piecing of the fabric, put them together. Added one set of borders. Do I use the “Yellow/Orange on white” which is on the right.. or the “White on yellow/orange”? The Binding is going to be that dark blue on the right in the below photo. To pick out the blues in the squares. I am more inclined on the white dominant border (the one on the right) – I think this lets the centre squares pop. But I would love to hear your suggestion. Well, I understand what he says.. but he doesn't understand the age old adage "Once a crafter, always a crafter". I picked up a sewing machine - a Bernette 20 - very recently and have been trying my hand on quilting. This quilt is going to be a Blooms and Butterflies quilt - with appliques all over. Which means, I need to learn to applique. And what you see above is the result of that learning. And this one are the mistakes. 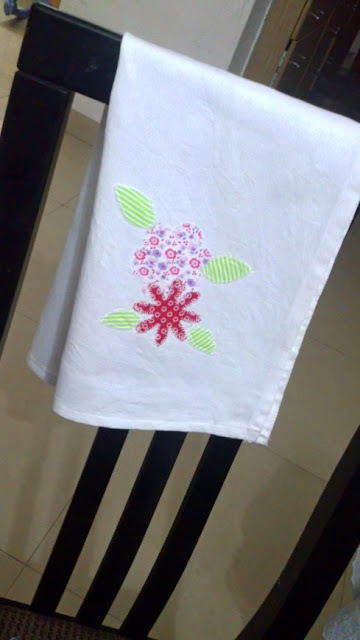 I'd die cut the flowers and leaves using the Sizzix Bigz Dies linked below and the sewed them to the tea towel using blanket stitches. Lesson from last night: You can NOT speed up some stitches. One stitch at a time, saves nine seam-ripping. 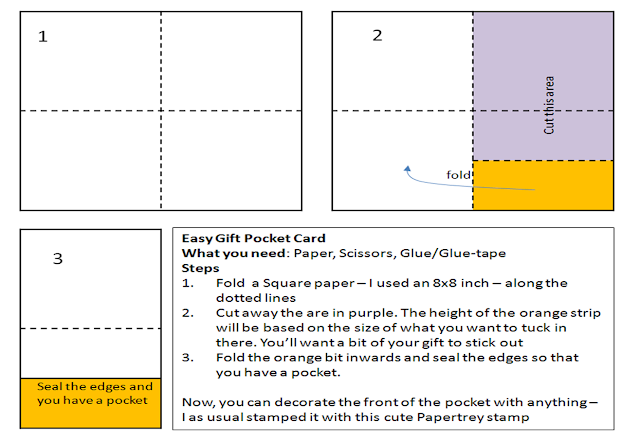 This is something you can quickly mass produce to give to your co-workers or children's teachers too. I die cut the biggest frame from the Sizzix Decorative Frame. I then stamped the sentiment and stuck those cute pearls. This morning K woke up and told me it was her favourite teacher's birthday and she wanted to make a card. Out came a couple of Sizzix dies and a few papers and we whipped up this card in minutes. K insisted on doing circles with the Sizzix - meaning turning the handles - and she could with a little bit of assistance from me. She could easily stick the papers and die cuts together and this card came together quickly and easily. My little K loves to colour images I stamp for her and the die cuts are quite easy for her too too. Do you craft with your little ones? What do they like to do? Time to sample some Frames from Sizzix. The winner will have the option of sending me a picture and write-up of whatever is made with the giveaway and I'll post that here on my blog. As always, I'll certainly contact you if you win and we can discuss on if you want the giveaway as patterned paper or Card stock. Please do leave comments on what you think of this giveaway. Feedback asking for changes are !MOST! welcome. Here is another version of my last post. Did you notice how I “ground” my birdie? I love the tips I get at Simplicity. Thanks, Susan. The colourful banner stamps is part of the Sizzix Banner Die. The stamps comes with matching dies. 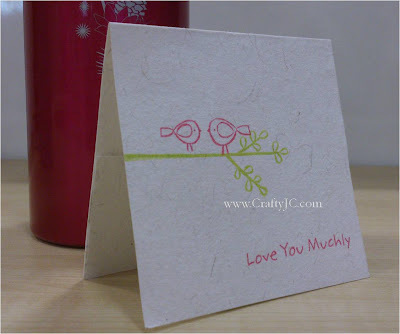 So easy if you wanted a layered card here instead of this One-Layered cutie. The Bookmark Card I recently got a set of gorgeous droolworthy products from Sizzix And I made these yesterday. I cut cut an A4 card stock length-wise, scored it in half and folded it. 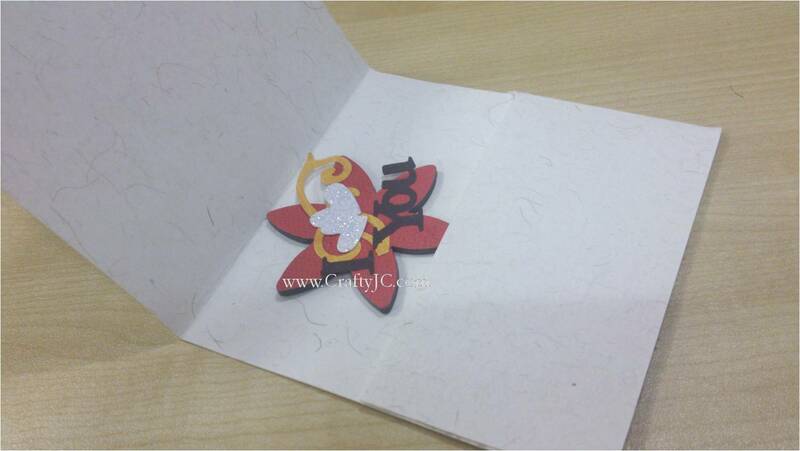 I now had a typical sized card which I diecut using the biggest of the Sizzix Banners die set. 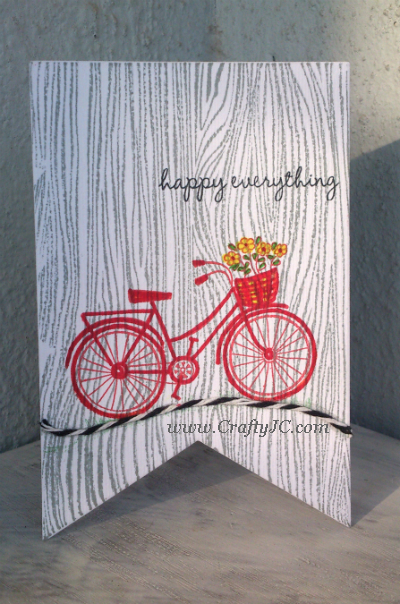 I then stamped the backround Woodgrain pattern and that cute Bicycle. Does that make sense? Or should I post some pictures? Now, I had a gorgeous "floating" bicycle. Susan at Simplicity keeps talking about how important it is to ground objects. I racked my brains for ideas how to ground my bicycle. Here is where I wish I had some grass stamp. I purposely kept this One Layered since this card doubles up as a Bookmark too. Be back tomorrow with another Bookmark card, now in my daughter's book. PS: please forgive those pencil marks on the card. Kunda, I've left a commnet on your blog. Please email me and we can chat regarding what you want. I'm glad you chose the Sizzix Mr. Owl - he is gorgeous! Do drop in tomorrow for this month's giveaway. What about Frames? Squares or Ovals..
Hello everyone. 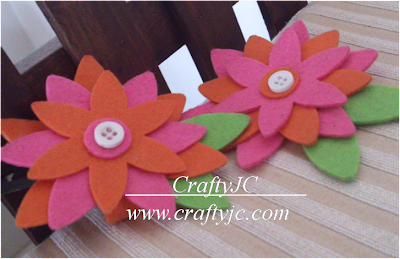 Just another couple of days for CraftyJC's Pick your Giveaway. Here is something I made with one of the giveaway options – one of my all-time favourites – Mr.Owl. I covered the chipboard with paper and then Die cut the owl. I always find this is the easiest way to get paper neatly on chipboard or magnet. 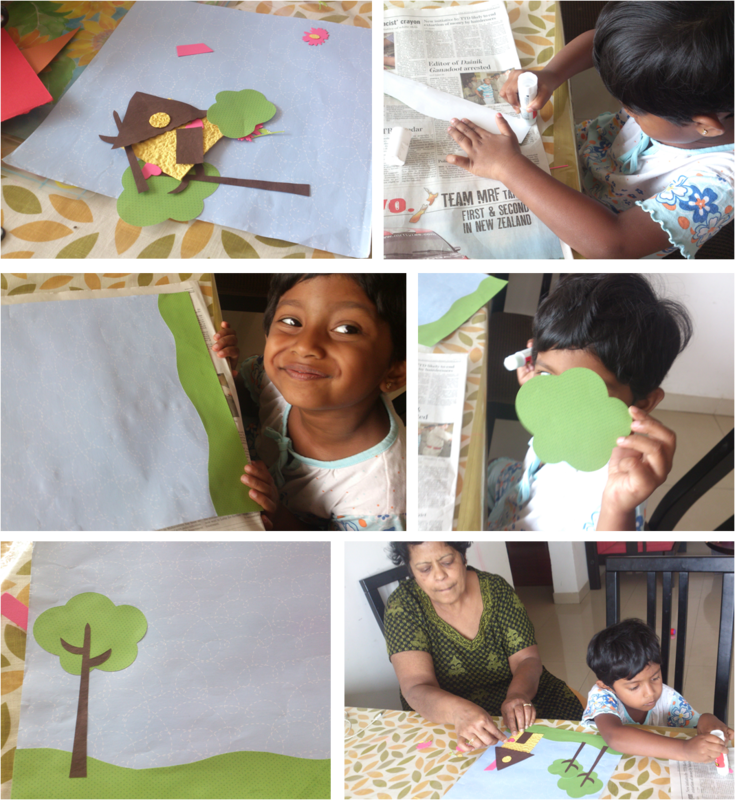 Then cut all other pieces in different colours and assemble the Owl. Use scraps to just about cover the smaller pieces rather than use large pieces of those precious papers. The easiest way to hang such things is using these paper clips. I got these for Rs.3.50/- in Landmark. Just attach the paper clip, thread it with a piece if twine or ribbon – Voila!! You have a frame to hang. I took of the backing of a post-it notes stack and attached it to Mr. Owl and clipped the pen on. You may add a piece double sided tape to the last paper for a firmer grip. You can hang this from your fan speed regulator knob like I’ve done in our house or the Fridge’s handle. Or even slap on a piece of magnet and stick it to your fridge. I hope you enjoyed this fun little post. Click here to view six gorgeous layouts and ideas to create your own Mother's Day cards - which can be easily used for any other ocassion too. These layouts and card ideas use the new range, Fresh Moments, by the uber creative Paula Pascual. Happy Crafting. 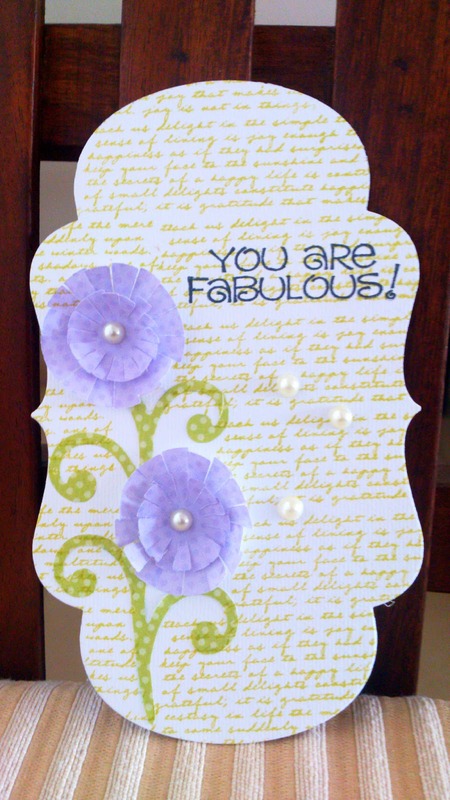 And don't forget to enter the Pick you giveaway - some gorgeous Sizzix Bigz diecuts. We all love giveaways. We all love choices. Put these both together and we have this killer combination - don't you agree? - Post this on your blog with your choice of giveaway. - As always, I'll certainly contact you if you win. [ETA] What if you don't have a blog? No problem at all. You are still welcome to join in. Just add your name here. If you win, I'll contact you to get your details. If you do have a facebook account, do link up this giveaway there. We sure do need more love all around. Don't you agree? What with so much hatred and war and crime against children. Here is a card and a quick and easy Pocket Card how-to. If you make anything like this, please leave a link here. I'd LOVE to visit. I love the fact that the Sizzix Bigz dies cut more than just paper. Like this for instance. I die cut magnetic sheets! The finished magnet is the same same size as what you see here. See how those fine die cuts sit so nicely with each other without crowding each other! Aren’t those birds super cute? And the word collage is a die cut too. I’ve kept a theme of love and swirls on the flower trio. But this is something you can easily adapt to any theme. Since the entire base is a magnet – you can easily use it for displaying on your fridge or the CPU in office. What went in – not much for the amount of stuff you see there! 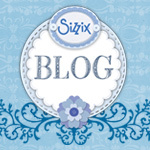 Thanks for stopping by – do pop in over to the Sizzix websites to view their blogs. And here are some gorgeous free papers too from Sizzix. Gorgeous Free Valentine Day Paper on Sizzix. I think you can use many of these through the year. Click here Sizzix Papers to download them. Did you know, the Sizzix Bigz dies cut more than just paper? And with such fabulous results too! 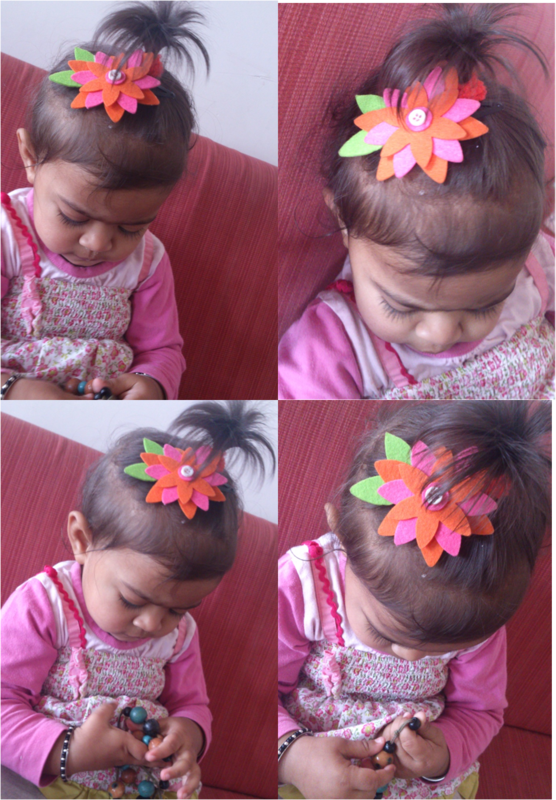 My 4yo daughter K and I went shopping the other day and she wanted to pick these hair clips everywhere. I kept promising her I'll make her some in her favouring Pink. Here is a easy hair clip you can make in 10 mins or less. Hello and Happy New Year. May God bless you with a healthy, happy New Year filled with His peace. I’d embossed some white Fabriano card stocks with gorgeous Sizzix folders and left them on my messy table for inspiration. And this is what I came up with. 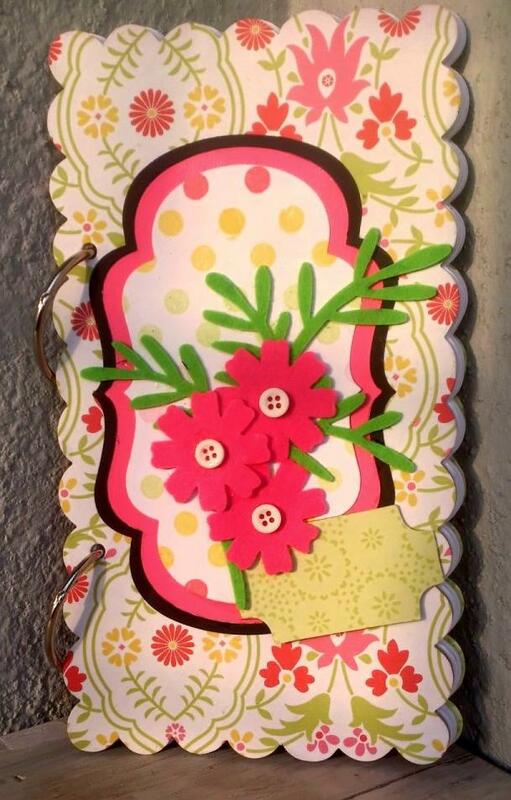 I love the strip of Scalloped border from Sizzix – Border and Hydrangeas. These work so well with Scrapbook layouts as well as cards. Don’t you think? I’m stamping a sentiment directly on the Patterned Paper – it took away the stress of adding another strip of paper. Though the green strip adds a bit more colour, I think right now I prefer the first version. What’s your take? My new year resolution is not to buy anything other than Fabriano Elle Erre card stock and Memento inks if I run out of basics. And also to craft for pleasure. No deadlines this year. What is your crafty resolution? I got the Pebbles Ever After stamp for the roses. If you’d like to buy the other two stamps (flower branch and castle only), please email me (mail.craftyjcATgmailDOTcom)and we can talk.